I didn't realize how much of the red, white and blue color theme I have been wearing back to back (here and here) but apparently I am subconsciously feeling patriotic. 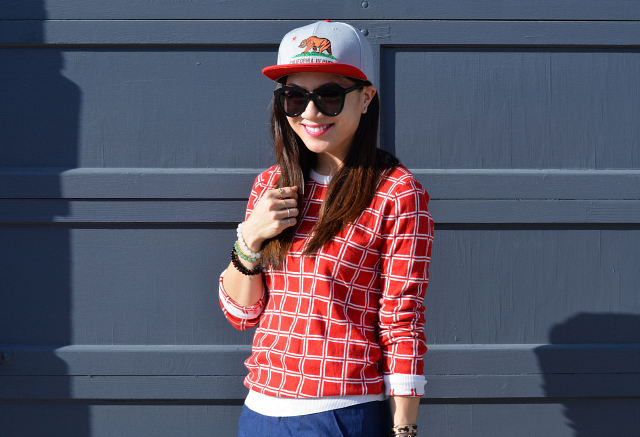 I first received this California hat last year but, as you may remember, I mentioned I have been in the process of cleaning out my closet so I'm wearing older pieces I haven't worn in a while. I really like the sporty vibe of this outfit since I am not very athletic, except when I watch sports on TV (and that time I said I would do Zumba and I did and still do...#nojudgement). Thanks for stopping by my blog! I love your style. Those leopard shoes are lovely-but I love just about anything leopard! I love that bag! Such a great thrift find!! You're so adorable! What a great look! Directly after reading the title of your post I followed it with "knows how to party." LOL I love this look. 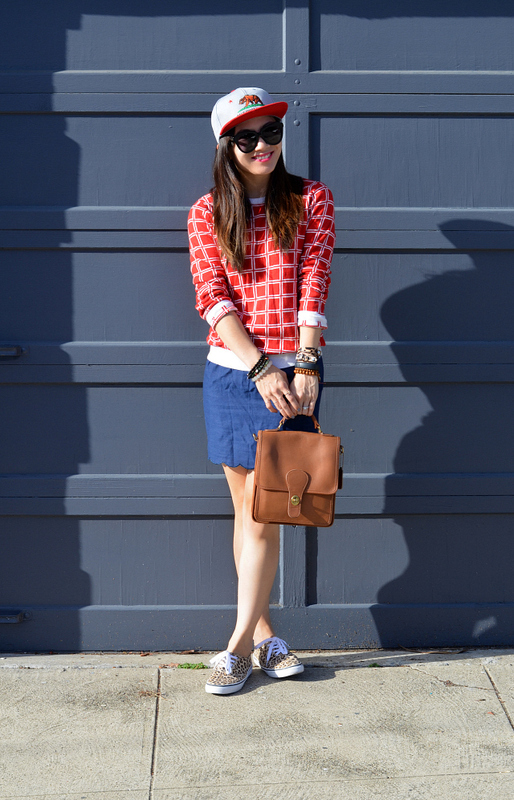 The hat is the perfect casual balance and those sneakers are so cute! Those colors look great on you! 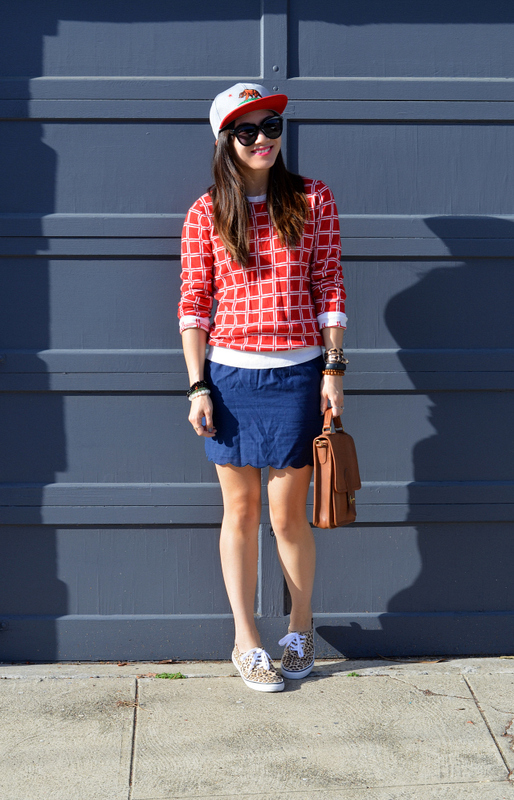 I like that paneled sweater and the scalloping at the hem of the skirt is really sweet. i love this outfit, seriously adorable! and that hat so fun! You mix prints so well. I would of never thought to wear the sneakers with this, but it looks good! 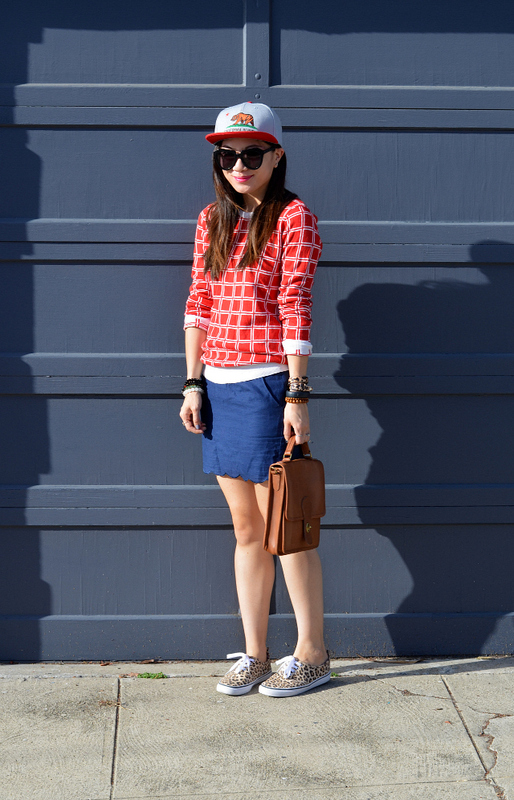 I love the fun, sporty vibe of this outfit! And what a fabulous bag! love the colours in this! Haha I do that sometimes. If not patriotic I like to dub it "nautical". But you look great doing it so why stop?! I just looked back at your last three outfits and you totally are wearing red, white, and blue haha. It's a classic color combo, so I say yes! 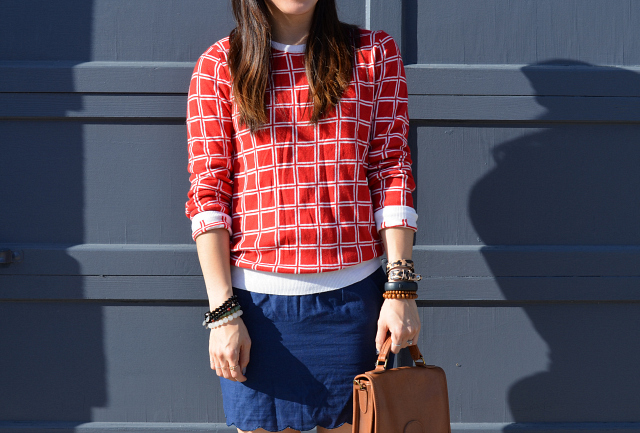 Love this checked sweater! You make me feel like I need/want leopard shoes. 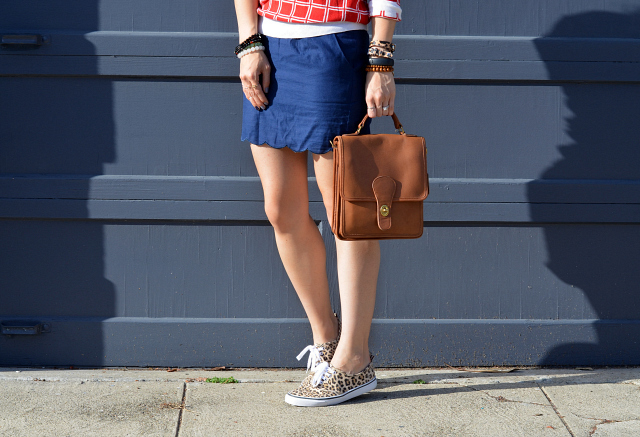 This sweater is the perfect mix between cozy and trendy! I'm wearing red, white and blue today for Spirit Week at work and I agree that it's a fun color combo. :) Those leopard-print shoes are wonderful -- too bad the H&M here isn't open yet!